1. First topic on the list is cooking. Well, what do you know? Most of my readers know I’m a passionate cook. I’m always on the look out for special ingredients, new recipes, kitchen utensils … you name it. At the bookstore you’ll find me in the cook book department, and I can never resist buying new ones. Not that I really use them, - mind you - but they inspire me to create my own recipes. Even as a toddler I used to potter around in my grandmother’s kitchen with a little plastic bucket and a wooden spoon and I can still remember the proud moment when I presented my very first culinary invention … Crassula soup. ROFL! 2. Betty wants to know how I got to live in Belgium. Well, that’s kind of simple. My mother and my father put me there … I was born here! There’s really nothing more to it! 3. Humor: One of my bear necessities of life. The most wasted day is the day we’ve not laughed. 4. Work: I only work four hours a week, when I cook for a family with two boys. Not a job that’s making me rich, but one I hang on to because I love it so much. My favorite moment is when they come in from school, and head straight to the kitchen to see what’s cooking. The best compliment is that little “mmmm” I get or their smiles telling me they’re happy to see me, and to know I’m being missed when I’m on vacation. Which reminds me, I really NEED to decorate the house for Fall today. I’m way behind! 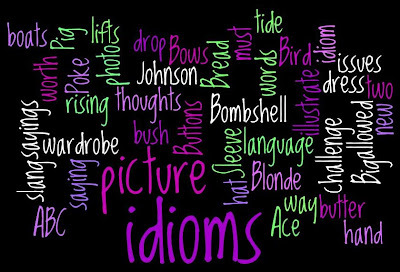 "A Thousand Words in Idioms"
As long as people have been around, they have tried to communicate with each other. As a means of getting the message across as clearly as possible, idioms and sayings have found their way into our language. Now, because "a picture paints a thousand words", I thought it would be nice to make this a photo challenge. The idea is to choose an idiom, or a saying, (even slang is allowed) and illustrate it with a picture. You can find the first edition here if you need some inspiration. From now on everybody can join in. No need to follow the alphabet, just pick two idioms and illustrate them with your pictures. Grab that camera or look in your archives. Just be creative, that's all I'm asking! I’m using the pictures I took of the Christo Rei statue in Lisbon last year as a theme for my idioms. It’s a very tall statue overlooking the city of Lisbon. I’m including this picture to give you an idea how tall it is. You can buy a ticket to use the elevator which takes you all the way to the top. It’s well worth it, the view from the top is stunning. As you probably all know by now, even when I’m at the top, I still tend to look up as well when I’m taking pictures. I had just recently gotten my (previous) new camera, so of course I had to try some new angles and find out how far my zoom would reach. Anyway, I digress. We’re talking idioms today, right? Here we go. “At one’s fingertips” : something is within one's reach. Sorry for the blurry finger, but I’m so glad I never deleted it. My archives turned out to be quite “handy” this time! Don’t forget to sign Mr Linky if you’re playing, okay? Oh and please, join in? It’s FUN!! Macro Monday, To Bee, or not to Bee. On our recent photo walk at the arboretum, I saw this beautiful artichoke flower. I like artichoke flowers, there’s something about them. Purple is my favorite color, and the flower attracts a lot of bees and insects, which can be a bonus in macro photography. CAN be, because in this case it’s not. Not really. I did not get a good shot of the bee because the flower stood too tall for me, and I really needed to stretch myself to get it right. Sometimes trying to get a picture can be a bit of a work out or a gym session! The next one was even more of a challenge. The flower leaned over in a 45 degree angle, and there was this modern art female figure behind it which I wanted to frame in as well. I had to take a couple before I got it right, and at the very last minute before I pushed the shutter, this bee flew off. So there, the bees in both pictures do not really add much. Maybe I would have preferred it if they were not there at all. But at least I got the composition I wanted. Find more Macro Monday pictures at Lisa’s Chaos. Heehee, you did not really think I have time for that did you? No, the truth is, I will be taking the weekend off from blogging. My things to do list keeps getting longer, I really really need some time to finish a couple of projects. Top priority is my lace, I need to run some errands AND we’re planning one last trip to Bokrijk Museum Park on Sunday. After this weekend the park closes until December, AND the weather gods have promised one last summery weekend. With Winter quickly approaching, we need to enjoy all the sun we can get! It feels a bit weird though. After all these years of daily posts, it kind of makes me feel guilty, like I’m deserting the army or something. On the other hand, merely writing this message does take a load off my back. I’ll see you all again on Monday. The last Fave Five of September, can you believe that? Summers usually end early ion Belgium and we all know we should be grateful for every ray of sunshine we get in September. For every sunny blue sky instead of rain we hold our breaths and thank the weather gods. It’s as if we’re getting a refund or something for all the rainy Summers we’ve endured the last couple of years, it’s still sunny and lovely out here!! Yaaaay!!! 1. Because we KNOW sunny days are gifts from heaven, we took a day off last Friday to go on a photo walk together at the arboretum. We got some exercise, fresh air and photo practice all in one go! We had a lovely afternoon together. 2. Saturday morning was dedicated to photography as well, we had a group excursion to put the theory into practice. I made a load of crappy pictures, but I learned a lot. 3. I was up very early on Sunday. It was a bit foggy, and that inspired me to grab my camera to try and catch that mysterious misty atmosphere. When I left the house I gasped seeing this gorgeous sunrise, and I hurried to the canal to capture it. I arrived just in time to make one photo before it disappeared. The village was still asleep and I enjoyed the silence and the peacefulness of this early morning walk. 4. On Tuesday, I had some fun in the kitchen preparing the quince. It was lovely to watch how they got the most beautiful rosy blush as the scent of vanilla, cardamom and cinnamon filled the house. It was a lot of work, quince are very hard, cutting them and coring them was almost like a work out but it was worth it! The jam and quince paste I made that same day taste delicious as well. 5. Yesterday afternoon I had a pedicure appointment. I little bit of luxury I indulge myself once a month. 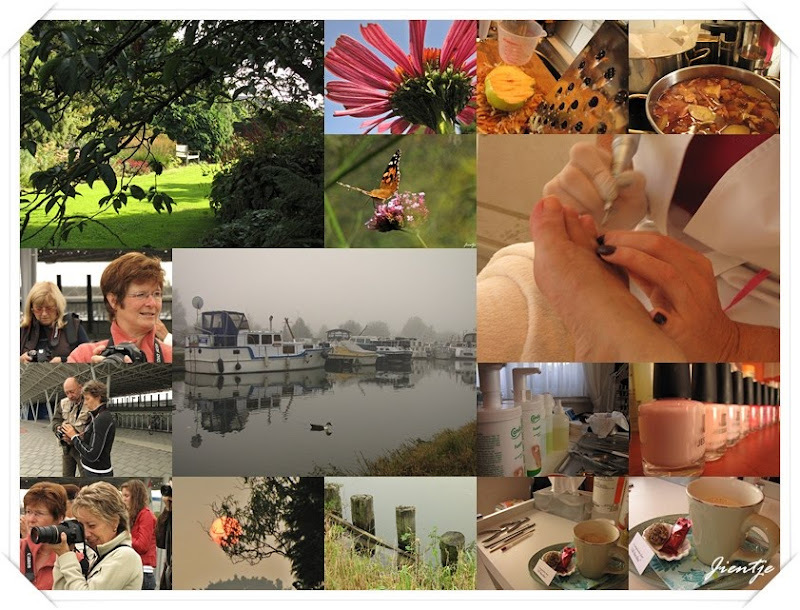 Over the years, Anne has become a friend and our monthly get together is so much more than just a pedicure routine. It’s so relaxing to just sit back while being spoiled and pampered. A cup of coffee, with a little chocolate on the side, a little foot massage, some nail polish … and some girl talk. Thanks Anne! My week was wonderful as you can see. It went by much too fast, as usual. Visit Susanne’s Living to Tell the Story to read more Fave Five posts. We’ve had some really beautiful days here in Belgium lately. We wanted to make the most of them before the cold and the wet take over again, so we decided to “steal” a day and go on a photo walk together. This time we revisited the arboretum of Kalmthout. We were there two years earlier on one of the very first photo walks I ever did with my husband, with my first point and shoot Canon camera. I had only started taking pictures a few months earlier. This is when I took this photo of a shelter house at the park, and I loved the view through that round “window”. Yes well, I know, technically speaking it’s not a real window, there is no glass in it, but I loved how the Ivy was beginning to make it’s way inside. Nature taking over. And I loved the view of two gates leading your eye into the picture, and the ever so slight ruby hazel-ish haze in the distance. … I found this ugly statue with that terrible smirk on his face. Grinning at me as if he was happy to see me. Goodness gracious!!! I did not remember having met him before? It was only when I got home and I looked up the original picture in my archives that I saw I was right. He had not been there the first time! It’s funny sometimes how things change eh? Not always for the better I should say. They must have moved that shelter house, because the view behind him looks so different? Where are the gates and that lovely green arcade? They sacrificed the view for the sake of “art”. PS: The view from the side was even worse. A pole – I think it was a dead tree trunk or something – with a bust on it, staring into a hole in the wall. With a flirty grimace on his face. No, I did not bother to photograph it. Maybe I should have. Click on the link to find more Window Views from all over the world. And don't forget to have fun and visit one another, okay? Okay, before you scroll down, let me warn you. And maybe even an apologize is in order here. You know, this post contains pictures of food, so I’ll probably make you hungry again. But what’s even worse is that there is a picture of me in it too. A very crappy one at that. It’s blurry, I had a bad hair day, I’m terribly camera shy and I do NOT look good in pictures. I DREAD to have my picture taken. I prefer to hold the camera instead of facing it, believe me. But it does show the idiom I want to use today perfectly, so there. I’m sorry. Now scroll past it please!!! b) you have a lot of issues to deal with in life. In the soup: If you're in the soup, you're in trouble. I’m very anxious to see what you’re going to come up with this week. Please join the fun, it’s really not that hard, and I would LOVE to welcome a couple more players? Don’t forget to sign the Mr Linky? My friend Annie gave me a big bag of quince fruit last week. For now, their rustic look and their divine perfume create a lovely autumnal atmosphere in my kitchen. Not for long anymore, because they’re begging me to prepare them. And I will. Today. But first I want to share these pictures with you. Lou suggested I’d do a still life with them, so I took them outside and had a little bit of camera fun with them. I made a little composition with a small pumpkin and a vine leaf and tried a couple of different angles. And if my plan works, there will be more rubies to come, because I did some research and it looks like they turn into a very pretty deep ruby color if you poach them. Well, not always, that is. I’m just keeping my fingers crossed mine will? Monday again? Where has the weekend gone to? It was a long weekend for me, because my husband took Friday off to make a photo walk together. It was a beautiful day, September weather has been very kind to us these last few days so it was a great opportunity to spend some time outside while trying to capture the beauty of Fall. I loved every minute of it, there were bees and butterflies and beautiful flowers, photo opportunities galore. I looked it up, because I could not remember who did this song. I was surprised it was Abba! This morning was a very foggy morning so I took my camera for a walk. Arriving just in time to capture this gorgeous early morning glow. A Thousand Words in Idioms, Up or Down? Weekly Winners, Signs of the Season. Modern Lace, by Me. The Video. A whole day ahead of me ….